TITUSVILLE, Fla. – A new riverfront hotel planned near the Kennedy Space Center Visitor Complex will add another launch show to see the growing number of rockets that lift off from the space coast. The five-story Indian River hotel will be closest to the launch at NASA's Kennedy Space Center and Cape Canaveral Air Force Station as well as commercial space companies operating at Exploration Park. "The increased interest and activity of our country's space program makes this the ideal time to open a new family-friendly hotel near the Kennedy Space Center and visitor complex," said Scott Socha, president of Delaware Nord's parks and resorts division. The hotel has a large outdoor swimming pool and rooftop terrace and bar where guests can watch rocket launches. A Bistro serves full breakfast and evening menus and serves Starbucks coffee. A meeting space of 800 square meters will be available for weather events. On March 6, the city of Titusville voted the Planning and Zoning Commission to give Delaware North the green light to continue the construction. According to the meeting, there is another five-storey Hyatt Place hotel under construction at a nearby lot next to Boeing's offices. According to a report from News 6 partner Florida Today, the 118-room hotel will include a 24-hour fitness center, free breakfast and an outdoor pool and patio and are slated to open this fall. 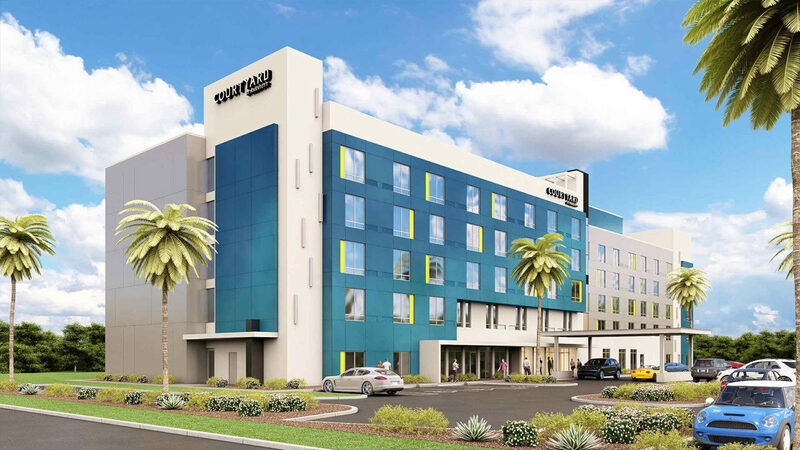 In a press release, Delaware North said the groundbreaking of Courtyard by Marriott is expected this summer with a scheduled opening date of autumn 2020. The project will create about 50 construction works and 35 permanent part and full time jobs.